Chinese poetry is something well worth exploring. While English speakers look back to the time of Shakespeare and Milton 400 years ago as a Golden age, Chinese look back far further, to the Tang dynasty 1200 years ago as their Golden age of literature. The longevity of the language has much to do with the continuous poetic tradition. Chinese poems written a thousand years ago still read fresh and modern and this is mainly because the language has changed so little. Poetry has remained a popular literary form in China for many centuries and Chinese people will often know popular poems by heart. Many have had a go at writing poems themselves including political leaders like Chairman Mao. As Chinese characters are not principally phonetic, changes in the manner of speaking have not affected the impact of poems as has happened in other languages. Chaucer ➚'s English is barely readable after 600 years. However, there have been changes, and sometimes the Chinese rhythmic structure has been lost as well as some of the characters that have fallen out of use over the centuries. The first widely known work of poetry is the Shijing 诗经 ‘Book of Odes’ which is a collection of poems covering four hundred years in the Zhou dynasty (2,500 years ago). The golden age of Chinese poetry was the Tang dynasty when many poets composed extensive sets of poems. An astounding 48,000 poems have survived from this time. After the Tang, poetry became stultified, the ancient tradition was so admired and well established that poets struggled to establish a modern style not rooted in the glories of the past. However the 词 Cí style of the Song dynasty did become a popular form that was more fluid and less regimented than those of the Tang. Many poems contain allusions to people and events from Chinese history, and that makes understanding poems a challenge to non-Chinese. A key attribute of Chinese poetry is that it is concise, each character places a thought, an impression, an image. There is no need for formal grammar and the small words like in, the as well as 'verbs' are generally missed out. Emphasis is put on use of rhythm and sometimes in a balanced form of the characters so that it looks visually pleasing on the paper. The reader assembles the series of impressions into a whole piece in a very direct way. Translating Chinese poems into English poses all sorts of challenges and many eminent American and English poets (for example Ezra Pound ➚) have spent considerable time developing fine translations. Writers have tried to convey the spirit of poems in different ways. Although much is lost in translation the core intended meaning can be understood and appreciated. Qu Yuan was one of the greatest of classic Chinese poets. This image was featured in a book called Sancai Tuhui 三才图会, which was published during the reign of Wanli Emperor of the Ming Dynasty 明朝万历年间王圻. Photo by Wang Qi. Image available under a Creative Commons license ➚. 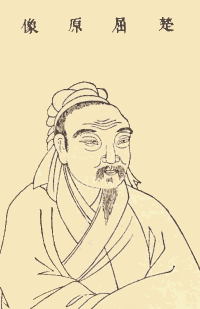 Qu Yuan is best known for his connection with the Dragon Boat Festival. 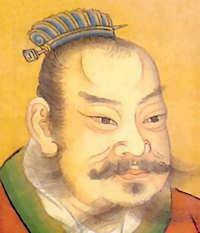 He was a statesman and poet of the Warring States period (about 2,500 years ago). He wrote some of the earliest known poems including elegies. His poems were the first to be attributed to an individual writer, up until then poems were published as anonymous collections. His most famous poem Li Sao 离骚 ➚ (Encountering Sorrow) alludes to his falling out with the King of Chu. Later, when Qu Yuan was falsely accused by a prince he decided to take a stand for the truth and committed suicide. He came to represent the laudable qualities of incorruptibility and loyalty. According to legend when he drowned himself in the Miluo river, the people of Hunan went out in boats to look for his body. The Dragon Boat festival commemorates this event, however the festival is older, when offerings were made to the dragon kings to bring rain for the summer crops. The lack of definite details about his life has led some to link his suicide to a battle where the state of Chu was defeated by the army of the Qin kingdom in 278BCE. Wang Wei 王维 was a poet and politician in China. Image available under a Creative Commons license ➚. Wang Wei was a leading Tang poet and painter. 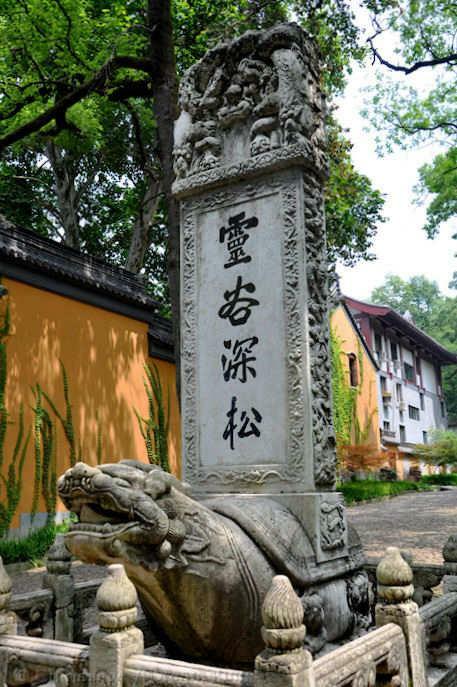 Born into an aristocratic family he passed the important jinshi examinations to become a senior court official in 721. Music and painting were among his many accomplishments and it was as a musician that he received his first post at court. Wang Wei was banished because of some minor breach in etiquette and traveled through the country being gradually promoted through a series of official positions. He owned a house in the hills 30 miles [48 kms] from the then capital of Chang'an. The An Lushan rebellion destroyed his career prospects and it was only around 759 that he was restored to his previous post. He is best remembered for poems that describe landscape and for his paintings of the countryside. Idly I watch the flowers fall. The night is still and the hills are empty in Spring. As the moon rises the mountain birds are disturbed. Now and then in the Spring stream they sing. 13th century, Southern Song dynasty. Artist:Liang Kai. Image available under a Creative Commons license ➚. 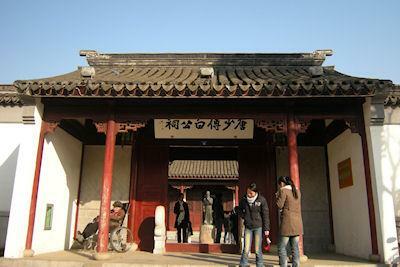 Li Bai together with Du Fu are considered the greatest of the Tang dynasty poets. Eleven years older than Du Fu, Li Bai, also known Li Po, was born north of China and moved to Gansu and then to Sichuan when a young child. Li Bai's grandfather was also a well-known poet. He is considered by some to have been named after the planet Venus as 李太白 Lǐ tài bái. He proved to be an able student but never took the examinations to become a government official. From Sichuan he traveled down the Yangzi River visiting friends. In 742 on the recommendation of a Daoist priest he was summoned before the Emperor Xuanzong. 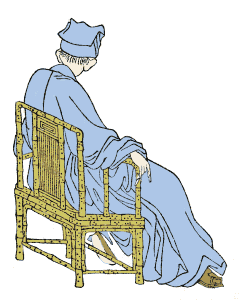 The emperor was impressed by his knowledge and philosophy and gave him an official position. He was eventually banished from court having upset the famous concubine Yang Guifei and then backed the wrong prince in the An Lushan uprising. He was lucky to escape with his life and was banished to remote Yunnan. Eventually his banishment was annulled and Li Bai traveled around the Nanjing area. In style he went beyond the rules laid down by previous poets, often writing about drinking and drunkenness. His poems seem rooted in the everyday life of ordinary people. 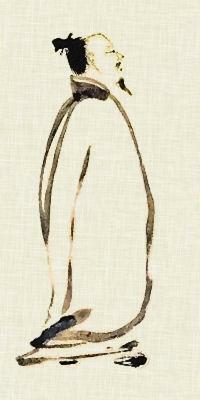 Du Fu stands out as one of the greatest of Chinese poets. Born in 712 close to Luoyang in Henan his ancestors were minor officials. Du Fu sought to follow tradition by entering the Imperial service. For many centuries this meant a grueling study of Confucian classics to be tested in examinations. Because of political and stylistic considerations he did not pass the examinations as candidates were scored for precise recall of the classics not in creativity. In 744 he met the great Tang poet Li Bai and this spurred Du Fu's commitment to poetry. Li Bai was eleven years older and the relationship was one of student and master rather than equals. By the continued use of connections at court in 755 he was appointed a minor official at the Imperial court. External events blew away his career path as the An Lushan rebellion broke out. After that his life was a series of short appointments at different locations, most importantly at Chengdu, Sichuan where his thatched hut can still be visited. His work was not much appreciated during his lifetime or for a couple of centuries after his death. Stylistically his work unites poet and nature, actions in nature interplay with the emotions of people. His poems are rooted in every day life with a somewhat positive outlook. Su Shi also known as Su Dongpo 苏东坡, arguably the greatest poet of his time, was born into a literary and wealthy family in Meishan, Sichuan. He excelled at his studies to pass the Jinshi examinations at the young age of 19 and soon became a protege of Ouyang Xiu ➚ 欧阳修. Su Shi took up government positions at various locations. Like many Northern Song dynasty scholars he had many accomplishments apart from poetry, he worked as an engineer, statesman, philanthropist and considered a great tea connoisseur. A piece of his calligraphy (Han Shi Tie 寒食帖 ➚) takes pride of place at the National Palace Museum, Taipei. A poem ➚ criticizing Wang Anshi led him to be exiled to Huangzhou, Hubei. Here he lived in poverty tending a small farm, it is then he took the name ‘Dongpo’ meaning Eastern Slope. On the fall of the Wang Anshi faction in 1086 he was summoned back to court before being banished again to Huizhou, Guangdong and then the island of Hainan. Although pardoned in 1100 he died on the way to take up a new post. Even though his work was banned for decades after his death 800 letters and over 2,700 poems have survived. The heritage of the Tang poems written over the previous 300 years can be seen in his work. Song poets wrote voluminously and the style is more expansive and wider than their more eminent predecessors. He wrote mainly in the 词 cí style. He is known collectively with his father and brother as one of the three Su poets. Changes in his circumstances required frequent moves and so travel is a recurring theme in his work. Contemplation of exile and the lack of challenging work add a bitter edge to his poems. Fu Bai Gongci (Bai Temple) Suzhou. November 2009. Image by 风之清扬 ➚ available under a Creative Commons license ➚. 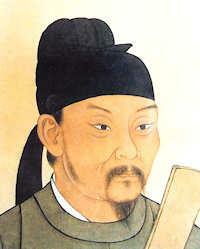 One of the most widely revered and read Chinese poet is Bai Juyi, another poet from the golden age of the Tang dynasty. His influence has spread to Korea and Japan. He was born in Taiyuan, Shanxi in 772 to a poor but scholarly family, in a period after the great Tang poets Li Bai; Du Fu and Wang Wei. To avoid the wars in northern China he moved south to Jiangsu province in 782. He succeeded in the Civil Service Examinations to reach the grade of jinshi enabling him to serve as a government paid official. The poem studied here is ‘A Visitor arrives’ by Du Fu. It was written about 760CE after the famous poet moved to his thatched hut ➚ near Chengdu, Sichuan. We have chosen this poem because it lacks the historical allusions that are present in many Tang poems, these are difficult to convey to a modern audience. Often they mention a place, a person or an event in Chinese history which to a Chinese will immediately give a rich context but this is lost on the rest of us. A poem can even use the shape of characters to give a visual style. As in English it will often use rhymes at the end of lines to give structure. In this case there is a repeated ‘ei’ sound on alternate line endings. All eight lines have seven characters, making a pleasing regular shape on the paper. This is a regular form Jintishi ➚ 近体诗 for a shi poem ➚ and there is a pattern to the tones on the characters and the overall structure. However, a lot of changes have crept in over a thousand years. Some of the modern 'simplified' characters are not the same as the ones Du Fu would have known and used. Pinyin uses the Beijing dialect and just as with Shakespeare, pronunciation has changed, if indeed Du Fu used the Beijing area dialect. Careful analysis requires taking all this into account, and all that is beyond this short introduction. 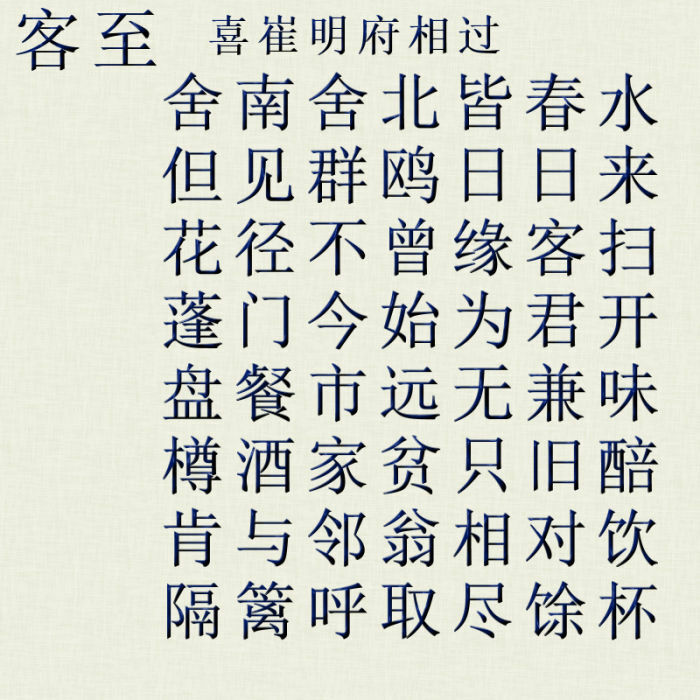 Here is the same poem laid out with a Chinese character font and underneath the pinyin representation. Translating an ancient Chinese poem into English is not an easy task, quite apart from the very different type of language and the age of the poem there are all sorts of decisions to make. Do you go for an accurate transcription, where each character in Chinese is represented in English by words in roughly the same order? Or do you use modern English to try to capture the spirit of the poem? The first step is to work out the English meaning of each character. If you just look up each character in turn in a dictionary then you end up with something much like simple software translation software would produce - gibberish. Well may be gibberish with a few hints as to the intended meaning as you can see from the following. This is all a bit artificial as you would not use the first 'current' meaning in the dictionary, in place of the historically accurate one. You can see that a simple transliteration is not very good. Now let's take each line in turn, coming up with a more reasonable translation. The subtitle gives the clue that the guest in question is an official. The translation of an ancient title for the official is tricky, so you have to take this on trust. The opening line sets the scene. The poet's hut is nearly flooded by Spring water. It immediately gives an image of an isolated building battered by the elements. The fact that it is Spring suggests the situation is developing and should get better. The second line adds another more detail to the situation, it indicates he has been isolated for some time as all he has seen are gulls. The pinyin for gull is 'ou' the sound of its plaintive call echoing down the centuries. Gulls are not the friendliest of birds and are usually seen only at a distance. He would have given a different impression if he had seen a sparrow. The repetition of 'day' seems to be stressing the emptiness of the day. There’s little point in sweeping the garden path for visitors. The scene is now brought closer to home and starts to convey a mood of loneliness as well as the physical isolation already laid out in the first two lines. The poet has been alone for some time and despairs of seeing anybody. The mood now changes dramatically, as often happens in poems of this style, a guest has come to see him, he is already at the gate. His house is in a poor state of repair. He needs to be able offer his guest a meal, but he does not have any decent food in the house. 餐 sūn is an archaic character for something like supper. The literal translation seems to be saying that the food is not worth tasting twice, there is no direct English phrase meaning quite the same. It does sound like a bit of an excuse as well as genuine poverty. Like numerous poets down the centuries, his thoughts now turn to drink. The poet's poverty is stressed again. His guilt at being so poor and having nothing much to offer is offset by the need for company, he asks his next door neighbor to come along too. So the scene is set for a friendly long chat over the wine, quite a transformation from the initial scene of desolation and loneliness. My medium sized dictionary does not have 馀 yú it means remainder. We are left thinking he's about to have a break from being alone and it could turn out to be quite an enjoyable time. Putting it all together there is a strong impression of solitude, poverty and longing for company. Not bad for a mere 56 characters written over 1,200 years ago. It is worth noting that many Chinese poems are not written in the western traditional order: left to right in lines running from top to bottom. When poems were written/painted on scrolls of paper or strips of bamboo the poem was written top to bottom starting at the right and moving left as the scroll is opened out. This is how you will see poems laid out on paintings. A great traditional painting will often have a poem written on it, this is not seen as defacement, the poem compliments the picture (and the painting the poem). Citation information for this page : Chinasage, 'Chinese Poetry', last updated 30 Nov 2016, Web, http://www.chinasage.info/poetry.htm.